Steve Jobs and Apple profoundly changed my life. I’ve worked with computers for most of my adult life. But I didn’t love working with computers until I got my Apple Macbook. So this article is a huge thank you to Steve Jobs for making my work so enjoyable. Here are a few of Steve Jobs’ very best quotes. I researched pirates several years ago after both Barrack Obama and John McCain declared that they would choose to be pirates for Halloween. I wanted to find out about the shadow side of pirating. What did it mean for Americans that our president had a shadow pirate within him? It turns out that a pirate during the golden age of pirating was someone who valued freedom over a long life. They were sick of working for “the man.” The privateers treated them like slaves. So they found a creative solution. Pirating was dangerous, and they seldom lived longer than two years. But they were free, and that meant everything to them. They were some of the first true democrats giving everyone on the pirate ship a vote. They shared the wealth with everyone using a very fair distribution system. Contrary to popular belief, they didn’t do it for the money; they did it for freedom. The fact that people were choosing to pirate over working for “the man” meant that “the man” had gotten greedy and needed to change. But since the man didn’t change, the pirate became a worthy opponent. Steve Jobs followed his dream and did what he was inspired to do even when people didn’t buy his products. He often said, “I never did this for the money.” He did it for the freedom to bring his ideas to life. Entrepreneurs are pirates. They take risks for the reward of freedom and creative expression. Sometimes they get rich, and sometimes they don’t. But they get to do what they are inspired to do. Over time Microsoft seemed to care too much about the money. People felt they were paying for overpriced and untested products. Apple was their pirate–their worthy opponent. Apple didn’t want to fight with Microsoft, they simply focused on doing what they do best, which was creating innovative products that are worth a little extra money. Today pirating in the computer world has taken on a whole new light. It means taking something instead of paying for it. Music was probably one of the most pirated downloads on the internet. Like the privateers, the music industry was asking too much for the product it delivered. Artists were producing albums that only had one or two good songs on them. No one wanted the whole album; they just wanted the songs that they liked. Itunes came to the rescue. It fixed the system and then invented the iPod so we could listen to the tunes we downloaded. But what most reminds me of Steve Jobs is what I loved about the pirates. They said that pirate boats could often move faster than the privateers because they were lean, mean machines. They could change directions with ease. 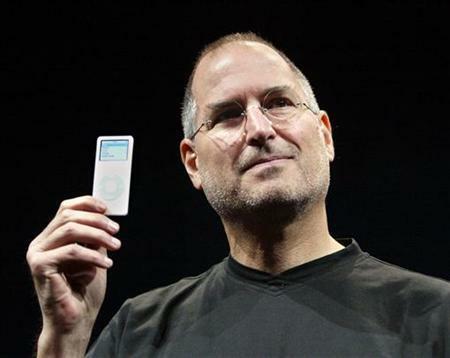 Steve Jobs displayed his pirate spirit as he reinvented Apple again and again. He was not afraid to navigate tough territory or quickly switch directions. When you get down to it, the Apple logo says it all. Adam and Eve eating the Apple caused life to become hard. But when Steve Jobs took a bite out of Apple, he made life easy and fun again. Thank you Steve for being one of the crazy ones!